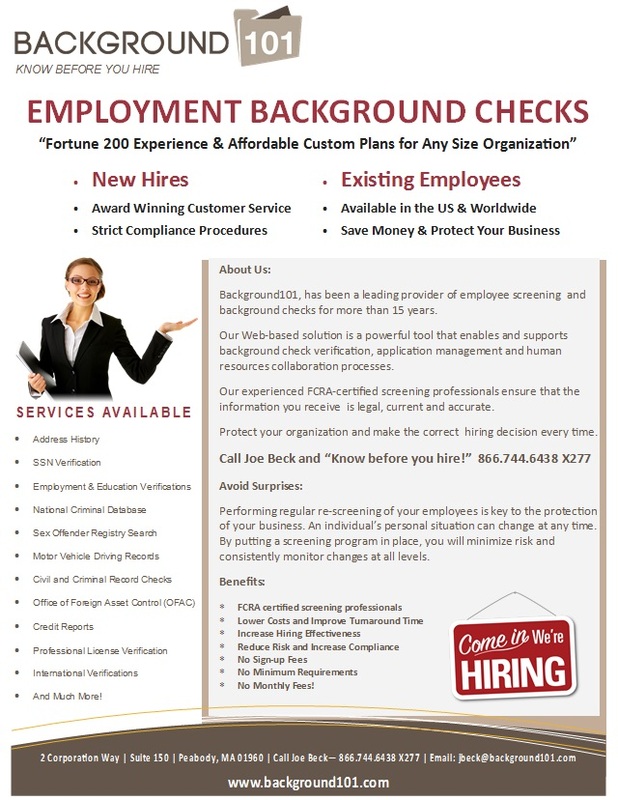 Joe Beck, the Background101.com Director of Corporate Sales, is offering every business, industry or organization in need of background screening services, a complimentary evaluation to ensure that each client is on the most suitable plan based on its current and future needs. Every type of organization can be confident implementing these professionally managed, FCRA certified, background screening / background check programs. Call 866-744-6438 Ext. 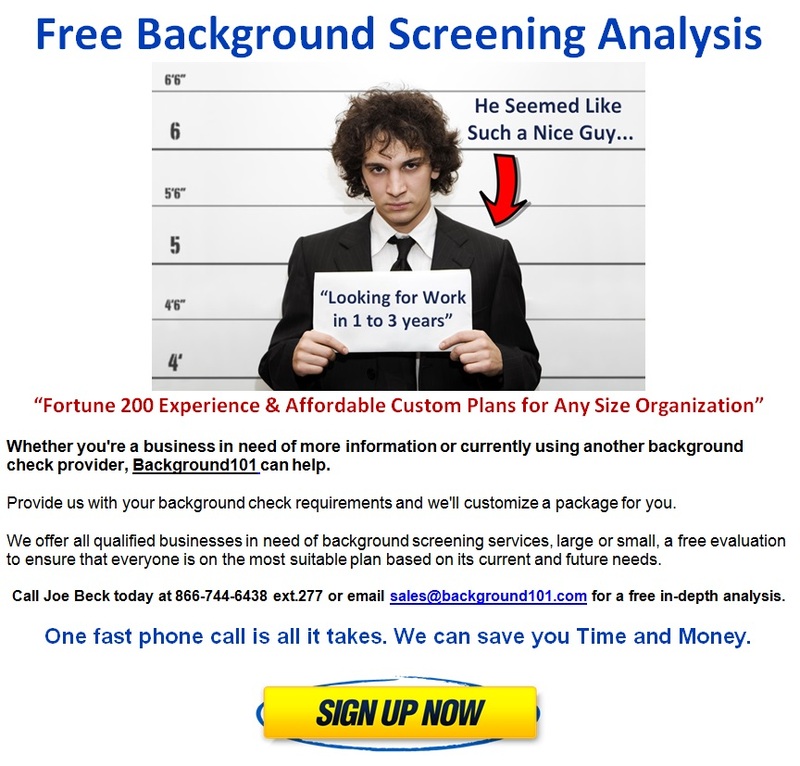 277 or jbeck@background101.com,for a free in-depth analysis and learn how to fully optimize a custom background screening program. U.S Based Background101.com, a trusted background screening service for over 15 years, is pleased to announce a complimentary background check/employee screening analysis program. Background101’s business model is a perfect fit for companies who need background check flexibility. Whether it’s a new business in need of more information or a company that is using another background check provider, Background101 can help. Provide Background101.com with the background check requirements, and a custom package will be prepared to match a business’s specific requirements. Regardless of current economic conditions, spending money wisely within any organization is always a top priority. Not all positions require the same level of screening. Every applicant’s screening can be customized to the level of security needed. Businesses will spend only what’s necessary every time. Background101.com continues to provide the latest background data, accurate reports, superior customer support, and commitment to best practices, multi-source data access and employee re-screening services to all qualified businesses, including Fortune 200 companies. Conducting background screening on employees has become a matter of necessity for employers for several reasons. Many applicants make false claims on their job applications/resumes or have been involved in criminal activity which they may not disclose. Pre-screening is a wise investment to ensure a secure workplace and protection against negligent hiring lawsuits. Failure to screen current and prospective employees can cost organizations of all sizes a significant outlay of cash and resources. Performing regular re-screening of employees is essential to the protection of every business. An individual’s personal situation can change at any time. By putting a screening program in place, risk will be minimized while monitoring changes at all levels. 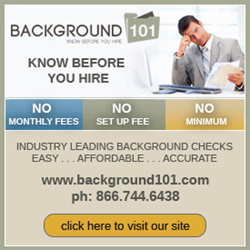 Backround101’s unmatched industry experience and reputation spans the complete spectrum of background employee screening services with no sign up fees, no minimum requirements, and no monthly fees. Background101’s FCRA compliant screeners are trusted by organizations of every size nationally and internationally. The privacy and personal data of all job candidates and employees is secure. Background101’s award winning customer support and attention to detail will reduce risk and increase compliance. Background101.com, located in Boston, Massachusetts, has been a trusted and leading provider of background screening information for more than 15 years and one of the nation’s most recognized pre-employment and existing employee screening services that features the latest technology, FCRA compliant professionals and secure data. Customers are provided with the information they need quickly, it’s simple to submit information and easily access completed reports. A team of experienced FCRA compliant screening professionals provides information that is legal, current and accurate. Personalized Support & Training is Included with All Accounts. Background101.com partners with clients during each step of the background research and screening process. Every background screening program is customized to meet a client’s particular requirements, saving valuable time and money. Call Joe Beck - 866-744-6438 Ext. 277 or jbeck(at)background101(dot)com,for a free in-depth analysis and learn how to fully optimize a custom background screening program.